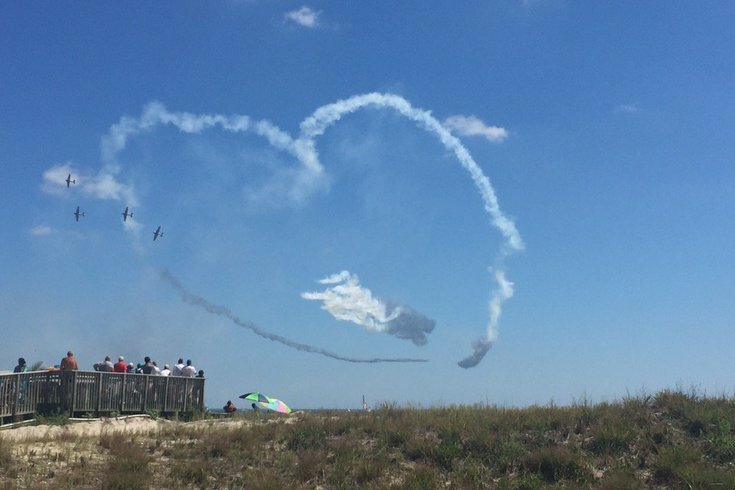 'Chemtrail hearts because they love to poison you in Atlantic City,' wrote Twitter user @YoItsMissBee to caption this photo taken at last week's air show over the seaside resort. Here we sit just two weeks from Labor Day, the traditional end of the summer shore season. Sure, September and even October are delightful down by the Atlantic, but the kiddies are about to start heading back to school in waves. Which is to say: The end is nigh. In the third-to-last installment of the Jersey Shore Town Power Rankings (JSTPR), a new hero sits atop the leaderboard while a usual suspect remains anchored in 16th. There's precious little time left to make a lasting mark on the Summer of 2016, shore towns. Here's hoping you've saved your bests for last. 15. Atlantic City (-9) Car crashes. People driving while shot. Steel Pier uncertainty. Corruption. All bad. The beauty of an air show sullied by the dangers of chemtrails? Even worse. Stay woke, sheeple. 14. Longport (+1) Blessing the ocean is worth a bump. 13. Cape May Point (-2) Back where it belongs after a marginal gain. But, yo, if you’re into olive-sided flycatchers, this is your spot. 12. Cape May (+2) Preach, anonymous Spout Off contributor. 11. Wildwood Crest (+1) Congrats to Wildwood Crest’s Joe Maloy for placing 23rd in the triathlon at the Rio Games! 9. Long Beach Island (+4) Despite not taking care of its infrastructure to the point of unexpected summer weekend traffic delays, LBI’s push toward making life safer for pedestrians warrants some upward trajectory. 8. Margate (+1) If surfing really is “a metaphor for so many things in life,” it's certainly a metaphor for a marginal gain in this week’s JSTPRs. Side note: Caught the “Point Break” remake this weekend. It was better than expected, but nowhere near as good as the original because Bodhi — at the core of his soul — was both driven and confined by the tides, much like the shore communities ranked herein. 7. Ocean City (-6) Congrats to McKayla Perry for the magical accomplishment of winning the Miss Ocean City pageant. But, victory in an annual event was not enough for this resort to maintain the top spot in the face of jet-ski accidents and boat chases. 6. Wildwood (+1) Tram cars battling monster trucks on the Boardwalk? Yaaaaas please. 5. Avalon (even) Cool sunrise. 4. Sea Isle City (-1) A trio of people from West Chester and Downingtown continue to sully the reputation of a fine resort city. This time, they got indicted for a Fourth of July armed robbery. For shame. Maybe a pair of distinguished poets will help with the algorithm next week. 3. Ventnor (+1) RIP, Bill Howarth. 2. Brigantine (even) Beach volleyball is fun and dolphins are cool. 1. Strathmere (+7) You know what happened in Strathmere this week? Nothing newsworthy, that’s what. Strathmere achieves top billing this week because shore vacations are supposed to be about relaxation, not chemtrails and wayward jet skis. To celebrate this monumental achievement, here’s video of Bubbles the Bulldog digging a hole in the Strathmere beach.